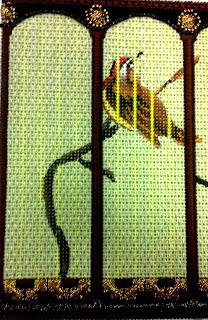 Michele Herron shares needlepoint tips and techniques from her current needlepoint projects. Love to bead, but hate having to wrangle with the slippery little escape artists? I know I vacuum loads of beads and sequins from my sprawling workspace (I get the 1/2 of the couch that our dog Morgan doesn't claim). ET has a new Needle Buddy--a small box with a (just right) tacky surface inside. The box attaches to your canvas with a magnet, so it your beads are right where you need them. I slipped one in my purse to use tonight--can't wait! 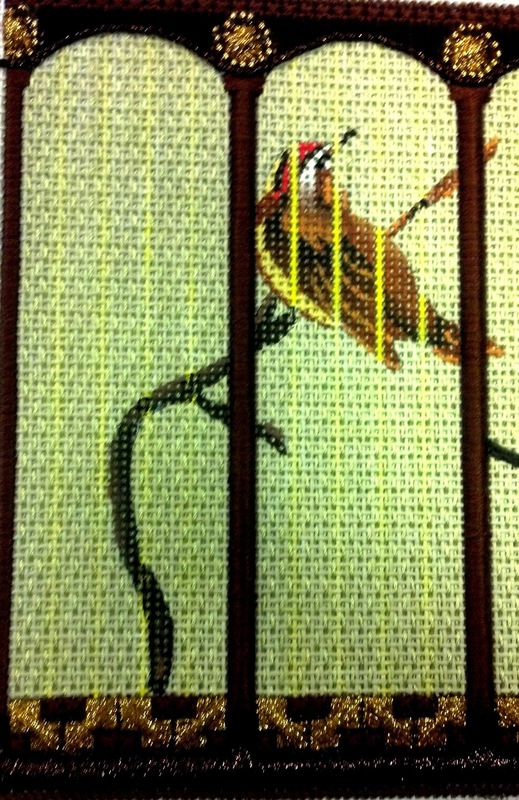 I started my day with Susan Portra's class "The Vintage Bird Cage", canvas by DJ Designs. Susan was her usual ebullient self, always good for non-morning people like me. After many days spent sorting, donating and packing up over 25 years' worth of "stuff" (we sold our house on Lake Michigan), I realized, yet again, that I have a thing for both boxes and birds. I have quite a collection of both and this canvas had to be mine. It is a Limoges-style hinged box with birds in a vintage cage. It's going to be a beauty. A few of my favorite things: learning to stitch a Pinched Cross...seeing the wonderful effect of a woven plait stitch done in two close shades of the same color...getting a PROS laying tool as part of the kit.,.round Rhodes surrounded by beads to make medallions...and best of all, Susan shared some of her students' amazing work. My second winter market class was taught by Sandy Arthur and sponsored by Sundance Designs and others. More of my favorite things...ironed Sparkles with added bling provided by Sundance beads and sequins; many wonderful border stitches, ruching and ruffled River Silks. I see this canvas as a stand-up with feet for Valentine's glamor. Sandy used Painter's Thread Ribbon Floss Cotton and Painter's Thread Pearl Cotton size 12 in the kit. Good news about Painter's Thread--Threadnuts is distributing the entire diverse line of Painter's Threads and they are all in stock. Hooray! Next up--Susan Portra's "Vintage Bird Cage" hinged box by DJ Designs. I signed up for "The Sweetest Tree" because I really wanted the chance to take a class from Sandy Arthur (and because I love any class that Sundance sponsors). Sandy is an ANG certified Senior Master Teacher and the author of the wonderful series of needlepoint books "Shapes of Needlepoint". My new favorite thing is stitching the stem stitch with beads. Following a stitch guide from Melissa Shirley, I have successfully used beads in the Jessica stitch. Now, armed with the stem and Jessica stitches using beads, I am going to look at my many books ad search for other ways to add beads to a stitch. 1) Those small twisted beading needles make excellent needle threaders. 2) A pincushion under the canvas holds your needle while you re-thread it for the drizzle stitch. My next class is also with Sandy--the canvas is a Sundance heart canvas and she promises to use beads, sequins, ribbons and Sparkles, oh my! Here you can see the different tricks I tried to outline the decorations on this ornament. The V-shaped design shows how a couched string of beads looks. I liked it, but chasing all those beads around while I tried to string them and then couch them was irritating, to say the least. The right top of the design below the V-shape shows the same gold beads tent-stitched. They barely show up, so they were nixed. At the top, I couched Kreinik Hot Wire on the anchor-shaped design. This is what I ultimately used for the outlines on the entire ornament. After a lot of practice, it wasn't even difficult! "Bling, Glitz & Glamour for Needlepoint"
I've been threatening for years to teach a class devoted to beading and embellishment. 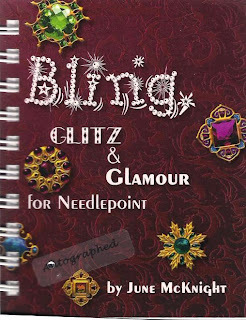 I recently took the time to read my autographed copy of June McKnight's book about needlepoint bling. And guess what? June has already written the class for me. 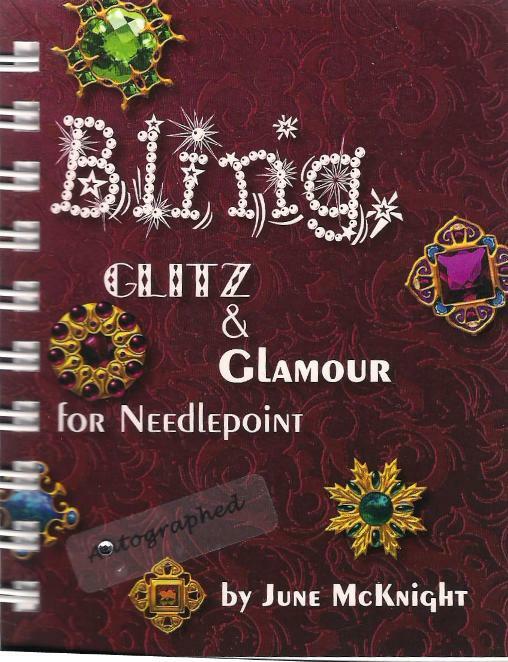 The book has loads of color photos and diagrams, cool stitches that incorporate beads, sequins, embellishments, rhinestones and more. I learned more than a couple of new things, always good. 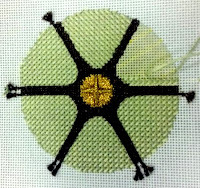 I definitely recommend this for stitchers who have or want to go beyond just needlepoint. We have a few of these in stock now! Not all stockings should be huge and make you cry "uncle" repeatedly. I love Susan Roberts' stockings--they are just the right size to match more "vintage" stockings and her sense of perspective and whimsy make them great fun...plus, her Santas always have a happy, not scary, face. I used Silk & Ivory Stardust in white for the cuff in a vertical stitch. By just unwinding the thread a little as I went along, I got great coverage and I loved the sparkly effect. The basketball is stitched with perle cotton and the Dotted stitch from "the Bible". This gives a great nubby texture, just like an actual basketball. I loved using Frosty Rays for the garland with a simple satin stitch. And that is stocking number 17--two more are on the (hopefully) expanding list. Hi there! I own the Bristly Thistle needlepoint store on Amelia Island Florida. I have been stitching for over 25 years and teaching in our store for the past few years.